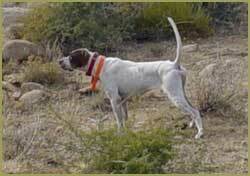 Great Basin Kennel was founded on the desire to raise and run the highest class wild bird dogs available anywhere. Our goal is to produce biddable dogs with superior scenting capabilities and the toughness required to hunt the extreme environments of the southwestern United States. We truly believe that if a bird dog can make it in the treacherous terrain of the southwest, it can make it anywhere. Given the vast availability of wild bird hunting opportunites on public land in the western United States, both Clarence and John travel extensively to hunt a variety of species from Hungarian Partridge in Livingston, Montana to the wily Ringneck in Pierre, South Dakota not to mention the fantastic Gambel's Quail and Chukar throughout Nevada. In addition, both John and Clarence have been blessed with the fortune to hunt the elusive Mearn's Quail in Southeast Arizona, Bobwhites in South Texas, Scalies in New Mexico, and Sharptail in Fargo, North Dakota just to mention a few journeys. While we are wild bird hunters first and foremost, we believe that in order to consistently produce the caliber of dog we expect, we must continually test our bloodlines on the field trial circuit. It will never be enough for Great Basin's bird dogs to simply find and point birds. If a dog is going to make it as part of this program, he/she MUST be of the highest class, biddable, exhibit the extreme intensity needed to compete, and demonstrate the endurance it takes to find the western upland birds.